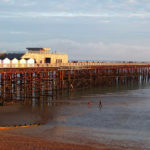 A formal account of the sale of the pier to Sheikh Abid Gulzar last June has finally been released into the public domain by the administrators of the Hastings Pier Charity, Adam Stephens and Finbarr O’Connell of Smith Williamson. It is contained in a “progress report” covering the period May to November 2018 filed earlier this month on the Mutuals Public Register, open to public viewing and downloadable at a price of £12. Disappointingly this account fails to set out any further explanation of the decision to prefer Mr Gulzar’s offer to those of other prospective bidders that included local community group Friends of Hastings, nor any justification of the knock-down sale price. 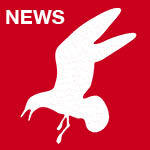 The administrators have merely repeated their previous insistence that it “represented the highest offer” and “was in line with” the requirements of the Heritage Lottery Fund (HLF). Nevertheless there are some eyebrow-raising contents. The price of the pier itself was confirmed as £60,000 plus VAT of £12,000 paid in the name of Mr Gulzar. 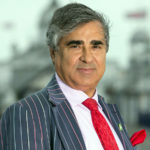 In addition there was a sum of £10,450 stated to be for the “chattel assets, stocks, contracts, intellectual property, goodwill, business name and cash float” purchased by Lions Hastings Pier Limited (LHPL), a company of which Mr Gulzar is sole director and shareholder. No explanation or significant breakdown of this latter figure is given, but all contracts, including those of all staff then employed, can be assumed to have been taken over by LHPL. 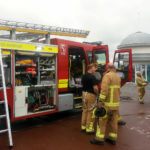 A net trading loss in excess of £358,000 is calculated to have been incurred in the period of the administration despite considerable work on the pier being undertaken throughout by unpaid volunteers. Of this sum nearly £130,000 accumulated in the period between 24th May and 23rd November – but presumably all, or virtually, all in the three weeks up to the date of sale, 16th June, since everything thereafter was the responsibility of LHPL. And these calculations don’t include the administrators’ own professional fees, for which they claim time costs of over £435,000, though it is not clear whether they will receive this full amount. No wonder the HLF, who were bankrolling them, became keen to rush the sale. Mr Gulzar and his company will have enjoyed the benefit of summer months’ trading in the immediate period after June, and presumably raked in higher bar and restaurant takings accordingly. Autumn weather was relatively kind too. 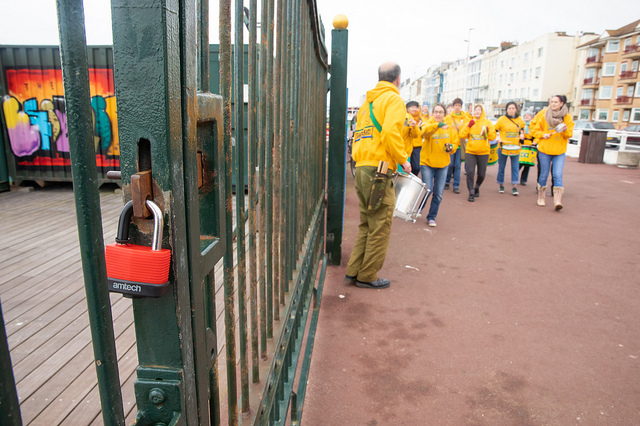 But if the administrators’ accounts are any guide to the economic realities of pier management out of season, no wonder that he has subsequently sought a different way to balance the books: shutting it down. 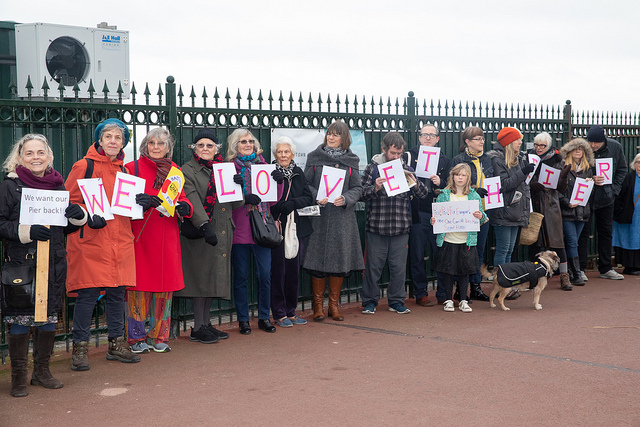 On Saturday 12th January there was a gathering of over 200 local citizens outside the locked gates. The organisers – not the formal pressure group Friends of Hastings Pier but an impromptu social media offshoot – insisted that it was a love-in, not a protest demo: a brief march along the seafront from the Goat Ledge cafe to the pier was led by local drumming band Sambalanco, with followers asked to form ‘an orderly queue’ as if filing past a body lying in state. They were invited to ‘hug’ the pier as they arrived. 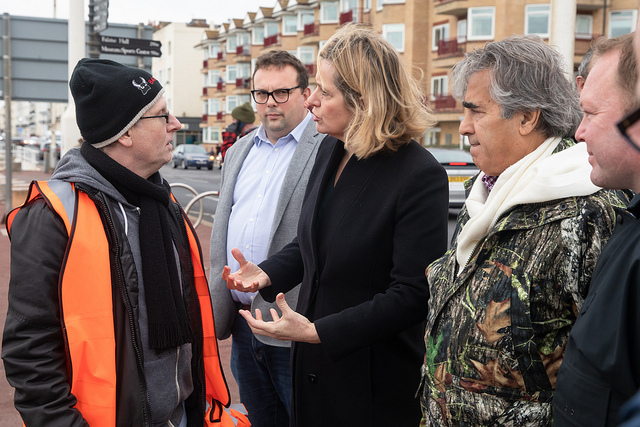 Mr Gulzar turned up, flanked by Amber Rudd MP for reasons which were not explained, and made a few incoherent remarks about the pier being closed while necessary works were undertaken for ‘public safety’. Leader of the council Peter Chowney also made an appearance, perhaps to assure political balance – but surely not to suggest that the council might take any interest in what is going on. There was no indication last week of any works being undertaken beyond the gates.